Pablo Jose López...speaks four languages...was accepted to medical school at 16 but decided to play baseball. In 10 starts with Miami, went 2-4 with a 4.14 ERA (58.2 ip/27 er). In addition, made 12 starts between Double-A Jacksonville and Triple-A New Orleans, combining on 2-3 record, 1.44 ERA (62.1/10), and .196 (46x235) opponent average...Did not allow more than three runs in any Minor League starts, and limited opponents to two-or-fewer eight times...Finished season on 60-day disabled list (right shoulder strain) ...Began season at Jacksonville, making eight starts with a 1-2 record and 0.62 ERA (43.2/3). Had a 1.6 BB/9.0 rate, while strikeouts per 9.0 was 10.6...Over first four starts with Jumbo Shrimp, allowed just nine hits over 19.0 scoreless innings. Allowed first run of season in fourth inning of May 13 start at Montgomery, ending season-opening scoreless streak at 23.0 innings... Took loss on May 13, allowing just one run on five hits over season-high 7.0 innings. Didn't walk a batter while recording seven strikeouts. Jumbo Shrimp dropped each of his first seven starts despite him allowing a total of just four runs (one earned)... Struck out career-high 10 on May 18 vs. Mobile...Earned first win in following start, May 24 at Mississippi...Earned Southern League All-Star honors, but did not participate in the game due to promotion to Triple-A New Orleans on June 6...Made first career Triple-A appearance on June 6 in a start at Las Vegas. Earned win after holding 51's to three runs (two earned) on six hits with a walk and four strikeouts over 6.0 innings...In four starts with the Baby Cakes, posted 1-1 record and 3.38 ERA (18.2/7)...Made final Triple-A start on June 26 vs. Iowa, tossing just 1.2 innings with one hit allowed and two strikeouts ... Recalled by Miami on June 30 and made Major League debut that night against the Mets. Limited New York to two runs on six hits and a walk (intentional), while striking out five, over 6.0 innings...At the time of promotion, ranked sixth among all full season Minor League pitchers in ERA and WHIP (0.93), and 12th in average against. He led all Marlins farmhands in ERA and ranked fourth in strikeouts (66)... Became 12th starter in Marlins' history to earn a win in Major League debut, first since Chris O'Grady on July 8, 2017 at San Francisco. He was the first right-hander to start and win his debut since Anthony DeSclafani on May 14, 2014 at the Dodgers...The night before his debut, Sandy Alcantara made his first career Major League start and also earned a win. Became first set of teammates to earn wins in their first career starts in consecutive days since April 9-10, 2012, when Yu Darvish and Neftali Feliz each made their first career starts with the Rangers. The last National League team to have such a duo was the Reds on April 15-16, 1967 with Gary Nolan and Mel Queen. - Stats LLC • Recorded first Major League hit on July 10 vs. Milwaukee, a single to left field off Jhoulys Chacín. Appeared as a pinch-hitter twice. In final pinch-hit appearance, on July 15 vs. Philadelphia, he singled, marking Miami's first pinch-hit by a pitcher since a tworun double by José Fernández on July 1, 2016 at Atlanta. Spent season at Single-A level in Seattle and Miami organizations, making 19 appearances (18 starts) for Modesto Nuts to start season and eight appearances (six starts) for Jupiter Hammerheads following July 20 trade...Set career highs with 8.0 innings pitched and nine strikeouts on July 7 at San Jose, allowing just one run on two hits and picking up final win in Seattle organization...That outing ended a three-game stretch in which he went 2-0, striking out 18 and allowing just four runs over 22.0 innings (1.64 ERA)...Over final five starts for Modesto, went 2-1 with a 2.41 ERA (33.2 ip/9 er)...Made Jupiter debut on July 26 vs. Florida, allowing two runs on seven hits and a walk over 6.0 innings, with six strikeouts...Did not earn a win for Hammerheads, going 0-3, but posted 2.18 ERA (45.1/11)...In first relief outing for Jupiter, on August 12, took over for rehabbing Kyle Barraclough in second inning and tossed 7.0 frames, allowing just one run on five hits, striking out eight. 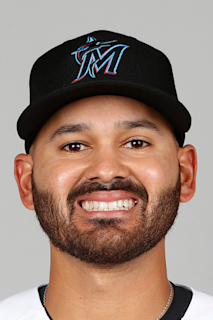 October 31, 2018 Miami Marlins activated RHP Pablo Lopez from the 60-day disabled list. September 1, 2018 Miami Marlins placed RHP Pablo Lopez on the 60-day disabled list. Right shoulder strain. June 30, 2018 Miami Marlins recalled RHP Pablo Lopez from New Orleans Baby Cakes. June 6, 2018 RHP Pablo Lopez assigned to New Orleans Baby Cakes from Jacksonville Jumbo Shrimp. April 21, 2018 Jacksonville Jumbo Shrimp activated RHP Pablo Lopez from the 7-day disabled list. April 3, 2018 Jacksonville Jumbo Shrimp placed RHP Pablo Lopez on the 7-day disabled list. March 9, 2018 Miami Marlins optioned RHP Pablo Lopez to Jacksonville Jumbo Shrimp. November 20, 2017 Miami Marlins selected the contract of Pablo Lopez from Jupiter Hammerheads. July 22, 2017 RHP Pablo Lopez assigned to Jupiter Hammerheads. July 20, 2017 Miami Marlins traded RHP David Phelps to Seattle Mariners for RHP Brandon Miller, CF Brayan Hernandez, RHP Lukas Schiraldi and RHP Pablo Lopez. April 1, 2017 RHP Pablo Lopez assigned to Modesto Nuts. May 28, 2016 RHP Pablo Lopez assigned to Clinton LumberKings from AZL Mariners. September 17, 2014 AZL Mariners activated RHP Pablo Lopez from the 7-day disabled list. March 5, 2014 RHP Pablo Lopez assigned to AZL Mariners from VSL Mariners. May 23, 2013 RHP Pablo Lopez assigned to VSL Mariners. July 4, 2012 Seattle Mariners signed RHP Pablo Lopez.